By Steve "Spike" Finch. Come explore the ancient art of stone turning using modern tools and techniques as Spike transforms a piece of stone over 150 million years old into a one-of-a-kind piece of art. 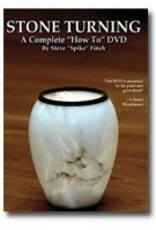 This DVD will teach you everything you need to know about turning stone. It will guide you through the complete process.